T-Mobile and its prepaid brand MetroPCS have both launched promotions that will give their respective customers free phones. The MetroPCS offer features up to $150 off for switchers making several of its phones free. T-Mobile is offering a BOGO on several devices. MetroPCS is now offering new customers up to $150 off of any phone when they bring their number to MetroPCS AND sign up for an Unlimited LTE plan. That means phones such as the Samsung Galaxy J7 Prime, LG Stylo 3 Plus, ZTE Blade ZMAX , LG K20, Moto E4, and even the 32 GB iPhone SE will be free. Customers will just have to pay for the taxes on each device. If you are a current customer, MetroPCS has a different offer available to you. Customers who add a line to an existing $60 Unlimited LTE plan can get a $50 rebate on any phone. Those who want to upgrade their phone can get the same rebate if they've been a customer for more than 3 months and are on or move up to the $60 unlimited plan. The rebate is only available on phones priced $79 or higher. MetroPCS is limiting its switcher rebate offer to 4 lines per account/household. Numbers that are currently on the T-Mobile network or have been active on T-Mobile or MetroPCS in the past 90 days are not eligible for this promotion. For the add a line rebate offer, there is a limit of 2 rebates allowed per account/household. All offers are available in store only. 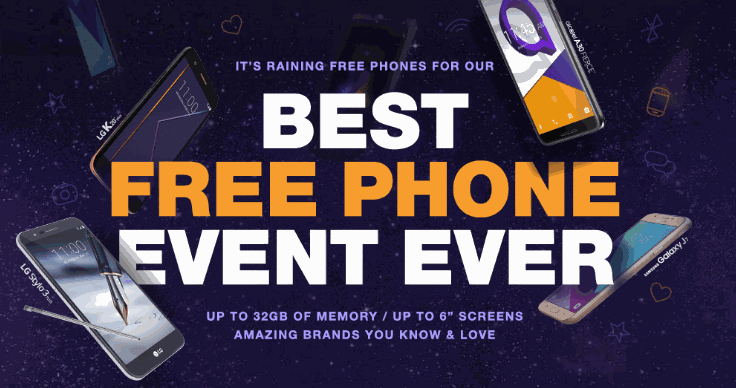 Starting on Friday, February 16th, T-Mobile is offering those who purchase an LG G6, V30 or V30+ on an Equipment Installment Plan (EIP) the ability to get a second phone of equal or lesser value for free. The phone will be made free in the form of monthly bill credits. New and current T-Mobile customers can get up to 6 phones with this promotion. The deal is also available to T-Mobile's business customers. T-Mobile is also running a family plan special. Those who add one line of service can get a 3rd line for free. Customers must have at least 3 full priced lines. Qualifying credit, service and finance agreements on both devices are required. Taxes are due at time of sale. If you cancel your service with T-Mobile the monthly credits will stop and you'll have to pay off the remaining balance on the phone. I agree the independently owned stores are not the ones to go to. Every city has corporate stores and when I buy another phone that’s where I go. As far as the free phones for loyallity that would be a good idea. Also stop with the reject 2nd class phones. And no my only afficiallion with them is as aa customer the same as you. I’ve been a metropcs customer since September of 2008 and not once have this company showed me any type of appreciation. Can I get a free phone of any kind? Metropcs can you answer this question for me? Becarefull doing up they will tell you case cover and screen protector goes with the phone that is the only way to do a upgrade. If you don’t go along with that they will tell you they have to call the main office for permission to see if they sell it without the extra of course the answer is no. MetroPCS has to be one of, if not the worst fone company when it comes to “customer service”. They’re very rude, and any suggestions or confusion is treated as “I’m an idiot”. I would rather not have a fone at all than deal with the bs on a monthly basis. Boost is offering great deals right now, get away from MetroPCS asap!! From everywhere in Massachusetts.